Have you ever driven down Webster Ave at the Elston Ave intersection and wondered what was happening to the land there? For such a prime location, it has sat vacant for a long time. I was so excited to recently learn that Belgravia is building a new condo building in that very spot, breaking ground this fall. I wanted more information, so I sat down with my friend Liz Brooks, Executive Vice President of Sales and Marketing at Belgravia, to get a larger understanding of the project. How is Triangle Square unique and different? 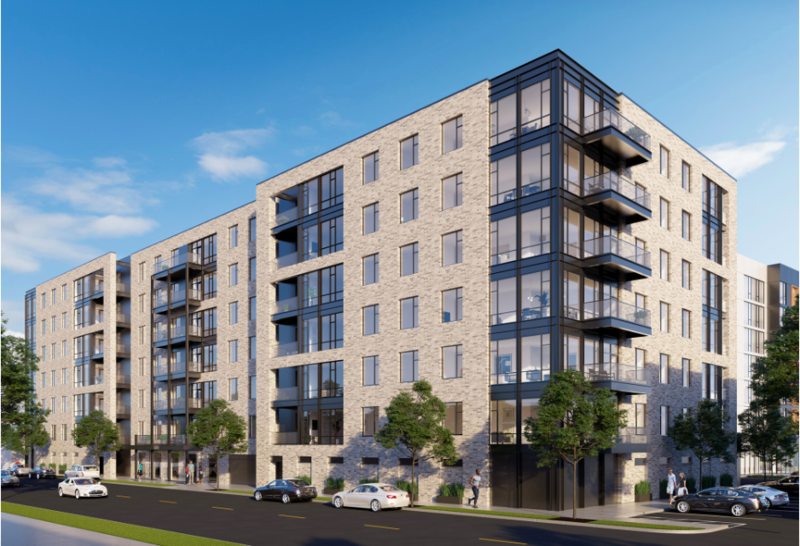 The location: Overlooking the North Branch of the Chicago River and sitting between Bucktown and Lincoln Park, Liz is very excited about the location of Triangle Square. It is close to the expressway, Clybourn Metra station, and because of its close proximity, it is only an 11 minute train ride Downtown. The price: Starting at $495K for a two bedroom, Liz believes that Triangle Square’s pricing is uniquely positioned to attract a new type of buyer to the area since new construction condos in the area are usually more expensive. There is a wide range of options, with three bedrooms ranging from $695K - $1MM. Design: According to Liz, the reputation for a “Belgravia Built” property is due to the painstaking level of detail that goes into designing each project. Belgravia’s designers considered the amount of cabinetry in each kitchen, the optimal closet and laundry room sizes, and how to maximize outdoor space as much as possible at Triangle Square. What is the aesthetic of the units, and are buyers able to personalize? Liz says that the units will have a contemporary feel with near 10 foot ceilings, wood floors throughout, high end Bosch appliances, and Italian kitchen cabinetry. Buyers have a broad array of choices from tiles to colors to cabinetry. Belgravia has two in-house designers to work with buyers in mixing and matching options. Are buyers able to see what a unit will look like? Yes! According to Liz, Belgravia has a fully immersive virtual tour allowing buyers to “see” a full unit including finishes, room sizes, etc. What is the timing for delivery? Belgravia will begin building this fall, with delivery the first quarter of 2020. Units are now for sale, and according to Liz there is a pre-construction purchaser credit of $25K available. For brokers, Belgravia is paying half of the commission at the time of ground breaking. Also, Belgravia is able to work with buyers on locking in current interest rates. Thank you, Liz, for such great insights into this exciting new project!